Save your time and book an appointment online with Dr. Mukesh Vats on Lybrate.com. 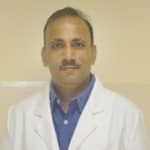 Find numerous Ophthalmologists in India from the comfort of your home on Lybrate.com. You will find Ophthalmologists with more than 33 years of experience on Lybrate.com. View the profile of medical specialists and their reviews from other patients to make an informed decision. My semester exams are going start on July 5 onwards. At what timing should I study? I reading but I am loosing concentration and memory loss. Means on seeing the book, I think I know everything, Its so easy to remember, but After closing the book, I can't recall even a single sentence of that answer! I know the theme of the answer , but i'm unable to present it on the paper . Please guide me ? Give me tips for how to remember the answers . Daily exercise of at least half an hour is a must. Even if you go to a gym, ask for aerobic and/or callisthenic exercises with whatever else you are doing. A healthy body harbors a healthy mind. With regard to memory, it is very important that your brain and body is ideally rested to be able to recall whatever is required, rather comfortably. Puzzles pose problems to the brain that help it to use new pathways and neurons, which give the brain considerable exercise. It taxes the left brain to use logic to solve the myriad possibilities which other activities do not stimulate. Crosswords are excellent for vocabulary learning and use. Jigsaws and Rubik cube stimulate different permutations to finally settle on the most likely one. Picture completion and anagrams help approach problem-solving from several angles. Do Sudoku, and memory co-relation activities and skills. Have a good night’s sleep, have a good breakfast of more proteins, meditate often, remain free of stress, eat a lot of fiber (whole grains, fruits and vegetables), nuts, avocado, eat dark chocolate, consume less of fat and use olive oil instead, do Yoga meditation exercises, etc. You need to check out if you are stronger visual or auditory. The visual is a better mode than the auditory. However, if you combine the two modes, you will get the best concentration. Have a special place of learning, which should be well lit, with soft painted walls, well-ventilated, with no distractions. When you get bored, study by writing. If you repeat learning, at least, five to seven times, you will apparently remember for a longer time. Sit comfortably but do not slouch. The reading material should be of a fairly large print. Study at small intervals of about 40 minutes and then take a break or change the subject. Short-term memory is a faculty of the left brain, and long-term memory is a feature of the right brain. When people are stressed, they tend to favor the right brain and abandon the left brain, where short-term memory resides. So, it is really very simple: deal with the stress and activate left brain functions. Here are a few suggestions to activate left brain function: shut your left nostril and breathe, move your eyes from right to left and vice versa for at least half a minute at a time, and do callisthenic exercises with some form of counting, regularly. There is a new exercise called Super Brain Yoga, which is done by holding the right earlobe with your left thumb and index finger, and the left earlobe with your right hand’s thumb and index finger. In this position, you must squat down and rise up and do this for five minutes every day. There is some memory enhancing techniques and study methods that your teacher will be able to guide you with. If your home life is full of distractions and stress, it is likely to affect your memory, adversely. In that case, I suggest that the family goes for counseling too. The following foods do help too: Blueberries, walnuts, turmeric, Spinach, tomatoes, broccoli, acorn squash, green tea, oily fish, boiled egg, turkey, apples, oatmeal, leafy greens, lentils, pumpkin seeds, avocado, cinnamon, thyme, sunflower seeds, and red wine. Avoid sugar and junk food. You may also include these noted foods that are good for your brain health: Brain-Friendly Foods MIND stands for Mediterranean-DASH Intervention for Neurodegenerative Delay. But the MIND approach “specifically includes foods and nutrients that medical literature and data show to be good for the brain, such as berries,” says Martha Clare Morris, ScD, director of nutrition and nutritional epidemiology at Rush University Medical Center. You eat things from these 10 food groups: •Green leafy vegetables (like spinach and salad greens): At least six servings a week •Other vegetables: At least one a day •Nuts: Five servings a week •Berries: Two or more servings a week •Beans: At least three servings a week •Whole grains: Three or more servings a day •Fish: Once a week •Poultry (like chicken or turkey): Two times a week •Olive oil: Use it as your main cooking oil. •Wine: One glass a day You avoid: •Red meat: Less than four servings a week •Butter and margarine: Less than a tablespoon daily •Cheese: Less than one serving a week •Pastries and sweets: Less than five servings a week •Fried or fast food: Less than one serving a week. I got infected with Eye flew what can do to get prevention from it as early as possible. Hi, I am Dipesh from AHMEDABAD. I hv severe problem due to which I am suffering a lot. I do feel fatigue and drowsiness always specifically after lunch. It is morning also. I can wake up with fresh even after 8 hours sleep. Specifically after lunch my condition become very severe. Even if I don't do anything, from my face & eyes anyone can see that I'm good tired. My eyes always remain watery abd red. I am suffering alot due to this. Pls help me. There is no harm in taking a small nap of about 30 to 45 mnts in the afternoon to get fresh again make sure yiu have a daily active and interesting routine of work activities hobbies and exercises avoid fried spicy junk food along with excessive use of tea coffee areated drinks sweets etc take one cap of supradyn daily for three months. My eyes are getting red and water is coming, slightly irritating and feel like something is stuck when there is more irritation and water in eye. Can someone suggest me some eye drops. Actually one of my friends dad is an ophthalmologist and he told me to use milflox eye drops. Is it ok to use? My son aged 13 is experiencing continued flowing of water from his eyes since yesterday. He has washed his eyes about a 100 times but for no use. He is also feeling a slight irritation. Seeing a bright object like tubelight also makes water comes out from his eyes. Please suggest best remedy asap. Dear lybrate-user, Your son is, most likely, suffering from conjunctivitis. Please consult an eye specialist at the earliest who can examine the child and prescribe the correct eye drops. You can take a homeopathic medicine euphrasia 30/4pills/4 times a day/3 days. I observe a small black particle moving in my right eye since two weeks. Ca n any one help me please what it indicates. Hello in eye we have 2 segments: anterior and posterior. In posterior segment we have a gel called vitreous this vitreous is made of collagen fibres. In some people, these collagen fibres gets meshed up and they start floating in vitreous gel when light enters the eye, these meshed collagen fibres cast a shadow on retina which is seen as floaters by patient. There is no treatment for this just avoid seeing them these are entirely normal consult ophthalmologist if these suddenly increase in number This is a provisional diagnosis. Consult ophthalmologist for detailed examination. Does Smoking Put Your Sight at Risk? The damage done to your eyes by cigarettes happens from two sources; the toxic smoke that hangs in the air which surrounds you as you puff on the cigarettes and 4000 odd toxic substances that enter your bloodstream once you smoke. In extreme cases, smoking also causes loss in vision. Macular degeneration: The risk of developing Age-related Macular Degeneration is there for people above the age of fifty. In case of smokers, the chance of developing AMD is three times more than in nonsmokers. It has been proven that smokers develop the chance of AMD ten years prior to non smokers. Cataract: This process involves the clouding of the lens inside the eye. Cataract develops with old age, usually. The risk of developing early cataract is common among smokers, who are twice at risk of cataract than non smokers. The effect of the cataract in the case of smokers is more severe. Glaucoma: Glaucoma is the eye disorder where the death of nerve fiber layer behind our eyes takes place, and that results in loss of vision. The increase in pressure within the eyes leads to glaucoma. Smoking enhances the pressure in your eyes, and so smokers are at a potential risk of acquiring this disease. Diabetic eye diseases: A number of eye diseases are accompanied with diabetes. This can result in blindness when left ignored or not paid attention to in severe cases. Diabetic patients who are smokers are three times more at a risk of eye diseases associated with diabetes. Optic neuropathy: This eye disease causes sudden loss of vision to the eyes without any pain. It happens due to the disrupted flow of blood in the arteries of the eyes. Smokers are 16 times more at a risk of developing optic neuropathy at an earlier age. Thyroid associated eye diseases: Patients having thyroid issues or Grave's disease have disorders in their vision. Grave's disease patients who smoke tobacco are likely to develop severe eye diseases associated with the thyroid. Dry eye: Smoking causes irritation to the eyes and affects the tear film of the eye. Smokers and passive smokers are likely to develop dry eye disorders. Smoking causes a lot of eye diseases and disorders, and smokers are at a higher risk of acquiring eye diseases than non smokers. I have something called mlf syndrome or one and half eye, can it be cured? And will it increase when my age goes on. When I concentrate on any subject (thing) its hurt my head so much. Is it eyes problem or my head?